Franco Baresi (Italian pronunciation: [ˈfraŋko baˈreːzi; -eːsi]; born 8 May 1960) is an Italian football youth team coach and a former player and manager. He mainly played as a sweeper or as a central defender, and spent his entire 20-year career with Serie A club Milan, captaining the club for 15 seasons. He is considered one of the greatest defenders of all-time and was ranked 19th in World Soccer magazine's list of the 100 greatest players of the 20th century. With Milan, he won three UEFA Champions League titles, six Serie A titles, four Supercoppa Italiana titles, two European Super Cups and two Intercontinental Cups. With the Italy national team, he was a member of the Italian squad that won the 1982 FIFA World Cup. He also played in the 1990 World Cup, where he was named in the FIFA World Cup All-Star Team, finishing third in the competition. At the 1994 World Cup, he was named Italy's captain and was an integral part of the squad that reached the final, although he would miss a penalty in the resulting shoot-out as Brazil lifted the trophy. Baresi also represented Italy at two UEFA European Championships, in 1980 and 1988, and at the 1984 Olympics, reaching the semi-finals on each occasion. The younger brother of former footballer Giuseppe Baresi, after joining the Milan senior team as a youngster, Franco Baresi was initially nicknamed "Piscinin", Milanese for "little one". Due to his skill and success, he was later known as "Kaiser Franz", a reference to fellow sweeper Franz Beckenbauer. In 1999, he was voted Milan's Player of the Century. After his final season at Milan in 1997, the club retired Baresi's shirt number 6. He was named by Pelé one of the 125 Greatest Living Footballers at the FIFA centenary awards ceremony in 2004. Baresi was inducted into the Italian Football Hall of Fame in 2013. Originally a Milan youth product, Baresi went on to spend his entire 20-year professional career with Milan, making his Serie A debut at age 17 during the 1977–78 season on 23 April 1978. He had initially been rejected by Internazionale, who chose his brother Giuseppe instead, while Milan signed Franco Baresi. The following season, he was made a member of the starting 11, playing as a sweeper or as a centreback, winning the 1978–79 Serie A title, Milan's tenth overall, playing alongside Fabio Capello and Gianni Rivera. This success was soon followed by a dark period in the club's history, when Milan was relegated to Serie B twice during the early 1980s. Milan were relegated in 1980 for being involved in the match fixing scandal of 1980, and once again after finishing third-last in the 1981–82 season, after having just returned to Serie A the previous season, after winning the 1980–81 Serie B title. Despite being a member of the Euro 1980 Italy squad that had finished fourth, and the 1982 World Cup-winning team, Baresi elected to stay with Milan, winning the Serie B title for the second time during the 1982–83 season and bringing Milan back to Serie A. After Aldo Maldera and Fulvio Collovati left the club in 1982, Baresi was appointed Milan's captain, at age 22, and would hold this position for much of his time at the club, becoming a symbol and a leader for the team. During this bleak period for Milan, Baresi did manage to win a Mitropa Cup in 1982 and reached the Coppa Italia final during 1984–85 season, although the team failed to dominate in Serie A. During the end of the 1980s and the first half of the 1990s, Baresi was at the heart of a notable all-Italian defence alongside Paolo Maldini, Alessandro Costacurta, Mauro Tassotti and later Christian Panucci, under managers Arrigo Sacchi and Fabio Capello, a defence which is regarded by many as one of the greatest of all-time. [a] When the attacking Dutch trio of Marco van Basten, Ruud Gullit and Frank Rijkaard arrived at the club in the late 1980s, Milan began a period of domestic and international triumphs, and between 1987 and 1996, at the height of the club's success, the Milan squad contained many Italian and international stars, such as Roberto Donadoni, Carlo Ancelotti, Marco van Basten, Ruud Gullit, Frank Rijkaard and later Demetrio Albertini, Dejan Savićević, Zvonimir Boban, Marcel Desailly, George Weah, Jean-Pierre Papin, Brian Laudrup and Roberto Baggio. Under Sacchi, Milan won the Serie A title in 1987–88, with Baresi helping Milan to concede only 14 goals. This title was immediately followed by a Supercoppa Italiana in 1988 the next season, and back-to-back European Cups in 1988–89 and 1989–90. 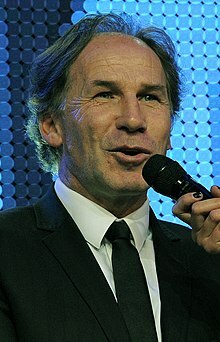 Baresi was also runner-up to teammate Van Basten for the Ballon d'Or in 1989, finishing ahead of his other teammate Frank Rijkaard, and was named Serie A Footballer of the Year in 1989–90. Milan also reached the Coppa Italia final during the 1989–90 season. Baresi went on to win four more Serie A titles with Milan under Fabio Capello, including three consecutive titles in 1991–92, 1992–93 and the 1993–94 seasons. Baresi helped Milan win the 1991–92 title undefeated, helping Milan to go unbeaten for an Italian record of 58 matches. Milan also scored a record 74 goals that season. During the 1993–94 season, Baresi helped Milan concede a mere 15 goals in Serie A, helping the club to finish the season with the best defence. Baresi also won three consecutive Supercoppa Italiana under Capello, in 1992, 1993 and 1994. Milan also reached three consecutive UEFA Champions League finals during the 1992–93, 1993–94 and 1994–95 seasons, losing to Marseille in 1992–93 and Ajax in 1994–95. Baresi won the third European Cup/UEFA Champions League of his career in 1993–94 when Milan defeated Johan Cruyff's Barcelona "Dream Team" 4–0 in the final. Baresi also managed to win the 1994 UEFA Super Cup, although Milan were defeated in the 1994 Intercontinental Cup, the 1993 UEFA Super Cup and the 1993 Intercontinental Cup. Under Capello, Milan and Baresi were able to capture another Serie A title during 1995–96 season, Baresi's sixth. Baresi retired at the end of the 1996–97 Serie A season, at age 37. In his 20 seasons with Milan, he won six Serie A titles, three European Cup/UEFA Champions League titles (reaching five finals in total), two Intercontinental Cups (four finals in total), four European Supercups (five finals in total), four Supercoppa Italiana (five finals in total), two Serie B titles and a Mitropa Cup. He scored 31 goals for Milan, 21 of which were on penalties, and, despite being a defender, he was the top scorer of the Coppa Italia during the 1989–90 season, the only trophy which he failed to win with Milan, reaching the final twice during his career. His final goal for Milan was scored in a 2–1 win against Padova on 27 August 1995. In his honour, Milan retired his number 6 shirt, which he had worn throughout his career. The captain's armband, which he had worn for 15 seasons, was handed over to Paolo Maldini. Milan organised a celebration match in his honour, which was played on 28 October 1997 at the San Siro, featuring many footballing stars. At age 20, while still playing in the Italy under-21 side, Baresi was named in Italy's 22-man squad for the 1980 European Championship (along with his older brother Giuseppe) by manager Enzo Bearzot. The tournament was held on home soil and Italy finished fourth. However, unlike his brother, Franco Baresi did not play a single match in the tournament. Euro 1980 would be the only time the two brothers were on the Italy squad together at a major tournament. At age 22, Baresi was named in Italy's squad for the 1982 FIFA World Cup. The Azzurri won their third World Cup, defeating West Germany in the final, but Baresi, once again, was not selected to play a match throughout the tournament. Baresi was also a member of the Italy squad that took part in the 1984 Olympics. Italy finished in fourth place after a semi-final defeat to Brazil, and losing the bronze medal match to Yugoslavia. Baresi scored a goal against the United States during the group stage. Baresi won his first senior international cap in a 1984 UEFA Championship qualifying match against Romania in Florence, on 14 December 1982, a 0–0 draw. Italy, however, ultimately failed to qualify for the final tournament. Baresi was not included in Italy's squad for the 1986 World Cup by coach Enzo Bearzot, who saw him as being more of a midfielder than a defender (although his brother Giuseppe was selected as a defender for the World Cup, as well as Roberto Tricella). He returned to the team for the 1988 European Championship, playing as a sweeper, where Italy reached the semi-finals under Azeglio Vicini, becoming an undisputed first team member and playing in every match. He made his first appearance in a World Cup finals match in the 1990 tournament, which was held on home soil, and he played in every match as one of the starting centre-backs, as Italy finished in third-place, after being eliminated by defending champions Argentina in a penalty shootout in the semi-finals. Baresi helped the Italian defence to keep five consecutive clean sheets, only conceding two goals, and going unbeaten for a World Cup record of 518 minutes, until they were beaten by an Argentinian equaliser in the semi-final. His performances earned him a spot on the 1990 World Cup Team of the tournament. After replacing Giuseppe Bergomi as captain for the 1994 World Cup under his former manager at Milan, Arrigo Sacchi, Baresi sustained an injury to his meniscus in Italy's second group match, a 1–0 win against Norway, and missed most of the tournament. He returned to the squad 25 days later, in time for the final, with a dominant defensive performance, helping Italy to keep a clean sheet against Brazil, despite the key defensive absences of his Milan teammates Alessandro Costacurta and Mauro Tassotti. After a 0–0 deadlock following extra time, the match went to a penalty shootout, and Baresi subsequently missed his penalty, suffering from severe cramps and fatigue. Following misses by Daniele Massaro and Roberto Baggio, Italy were defeated by Brazil in the penalty shootout. Following the World Cup defeat, Baresi made one more appearance for Italy, in an away UEFA Euro 1996 qualifying match against Slovenia on 7 September 1994, which ended in a 1–1 draw. Baresi subsequently retired from the national side at age 34, passing the captain's armband to his Milan teammate Paolo Maldini. Baresi amassed 81 caps for Italy, scoring one goal in a friendly win against the Soviet Union, and he is one of seven players to have achieved the rare feat of winning Gold, Silver and Bronze FIFA World Cup medals during his international career. Baresi is regarded as one of the greatest defenders of all-time. He played his entire 20-year career with Milan, becoming a club legend. At Milan, he formed one of the most formidable defensive units of all time, alongside Paolo Maldini, Alessandro Costacurta, Mauro Tassotti, Filippo Galli and later Christian Panucci. He was a complete and consistent defender who combined power with elegance and was gifted with outstanding physical and mental attributes, such as pace, strength, tenacity, concentration and stamina, which made him effective in the air, despite of his lack of notable height for a centre-back. Although Baresi was capable of playing anywhere along the backline, he primarily excelled as a centreback and as sweeper, where he combined his defensive attributes, and his ability to read the game, with his excellent vision, technique, distribution and ball skills. His passing range, technical ability and ball control allowed him to advance forward into the midfield to start attacking plays from the back, enabling him to function as a secondary playmaker for his team, and also play as a defensive or central midfielder when necessary. Despite being a defender, he was also an accurate penalty kick taker. Baresi was known for being a strong and accurate tackler, who was very good at winning back possession, and at anticipating and intercepting plays, due to his acute tactical intelligence, speed of thought, marking ability and positional sense. A precocious talent in his youth, throughout the course of his career, he was also stood out for his professionalism, athleticism, longevity, and discipline in training, as well as his outstanding leadership, commanding presence on the pitch and his organisational skills; indeed, he captained both Milan and the Italy national team. On 1 June 2002, Baresi was officially appointed as director of football at Fulham, but tensions between Baresi and then Fulham manager Jean Tigana led to resignation from the club in August. He was appointed head coach of Milan's Primavera Under-20 squad. In 2006, he was moved by the club to coach the Berretti Under-19 squad, with his former teammate Filippo Galli replacing him at the helm of the Primavera squad. He retired from coaching and was replaced by Roberto Bertuzzo. Brothers Giuseppe (left) and Franco (right) Baresi face each other in the 1979–80 Milan derby. Franco Baresi is the younger brother of Internazionale legendary defender Giuseppe Baresi. As youngsters, both players had tryouts for Inter, but Franco was rejected, and purchased by local rivals Milan. As he was the younger player, Franco was initially known as "Baresi 2". However, due to Franco's eventual great success and popularity throughout his career, which surpassed even that of his older brother's, Giuseppe later became known as "the other Baresi", despite also achieving notable success. Baresi is featured in the EA Sports football video game series FIFA 14's Classic XI – a multi-national all-star team, along with compatriots Bruno Conti, Gianni Rivera and Giacinto Facchetti. He was also named in the Ultimate Team Legends in FIFA 15. Order of Merit of the Italian Republic (30 September 1991). ^ "World Soccer 100 Players of the Century". Retrieved 25 July 2014. ^ a b c d e f g "Storie di Calcio: FRANCO BARESI – Calcio, tackle e fantasia". Storie di Calcio (in Italian). Retrieved 9 April 2015. ^ a b c d e f "Franchino (detto Franco) BARESI (II)". magliarossonera.it (in Italian). Maglia Rossonera. Retrieved 9 April 2015. ^ "Pele's list of the greatest". BBC Sport. 4 March 2004. Retrieved 22 November 2013. ^ a b c d e f g "A.C. Milan Hall of Fame: Franco Baresi". acmilan.com. A.C. Milan. Retrieved 31 March 2015. ^ Giorgio Dell'Arti (2 October 2013). "Biografia di Franco Baresi". Il Corriere della Sera (in Italian). Retrieved 12 May 2017. ^ James Horncastle (21 March 2016). "Gianluigi Buffon record cements his legacy as greatest keeper of all-time". ESPN FC. Retrieved 21 March 2016. ^ Paolo Bandini (21 March 2016). "Gianluigi Buffon humble as clean sheet record tumbles, but delight not universal". The Guardian. Retrieved 21 March 2016. ^ Rob Smyth (8 May 2009). "The Joy of Six: Great defences". The Guardian. Retrieved 9 March 2016. ^ "Nazionale: 2013, addio al catenaccio. Balotelli-Rossi coppia mondiale". La Repubblica (in Italian). 19 November 2013. Retrieved 9 March 2016. ^ Foot, John (2006). Winning at All Costs: A Scandalous History of Italian Soccer. New York: Nation Books. p. 228. ^ Mattia Fontana (19 August 2014). "La storia della tattica: da Sacchi a Guardiola" (in Italian). Eurosport. Retrieved 10 March 2016. ^ Corrado Sannucci. "MILAN 1988-1994: 6 ANNI DA CAMPIONI". Storie di Calcio (in Italian). Retrieved 10 March 2016. ^ Jonathan Terreni (19 June 2012). "Speciale squadre nella leggenda, Milan '93-'94 vs Inter '09-'10" (in Italian). Calciomercato.it. Retrieved 10 March 2016. ^ a b c d e "Milan and Italy's imperial sweeper". FIFA. Retrieved 17 March 2014. ^ a b c "Franco BARESI". FIFA. Retrieved 17 March 2014. ^ a b "Nazionale in cifre: Convocazioni e presenze in campo – Franco Baresi". figc.it (in Italian). FIGC. Retrieved 10 April 2015. ^ a b "World's greatest XI: the best ever football team in pictures". The Telegraph. Retrieved 21 July 2014. ^ a b c d e "Franco Baresi: Milan and Italy's imperial sweeper". FIFA. Retrieved 21 July 2014. ^ a b Gianni Brera (3 January 1992). "IL FURORE SPORTIVO SOVIETICO CI MANCHERA'". La Repubblica. Retrieved 27 January 2010. ^ Mario Sconcerti (23 November 2016). "Il volo di Bonucci e la classifica degli 8 migliori difensori italiani di sempre". Il Corriere della Sera (in Italian). Retrieved 27 December 2016. ^ a b James Richardson (1 November 2009). "Franco Baresi: One-on-One". FourFourTwo. Retrieved 28 September 2017. ^ a b c Alberto Costa (2002). "BARESI, Franco". Enciclopedia dello Sport (in Italian). Treccani. Retrieved 12 December 2015. .
^ "F. Baresi: Esordienti al "Pozzo"" (in Italian). La Stampa. 21 May 1982. p. 25. Retrieved 17 December 2018. ^ Giorgio Rondelli (5 June 1995). "Vialli Rambo, Tarzan Pagliuca: ecco la nazionale della Forza". Corriere della Sera (in Italian). Retrieved 7 September 2015. ^ "Baresi quits Fulham". BBC News. 21 August 2002. ^ "L'ALTRO BARESI" (in Italian). Retrieved 1 January 2015. ^ "FIFA 14 Classic XI". Archived from the original on 30 September 2011. Retrieved 17 March 2015. ^ "FIFA 15 Player Ratings – FIFA Ultimate Team Legends". easports.com. EA Sports. 10 September 2015. Retrieved 17 March 2015. ^ "Franco Baresi". L'Èquipe (in French). Retrieved 10 December 2015. ^ "Italy – Coppa Italia Top Scorers". rsssf.com. RSSSF. Archived from the original on 29 October 2015. Retrieved 10 April 2015. ^ "Italy – Footballer of the Year". rsssf.com. RSSSF. Archived from the original on 21 January 2015. Retrieved 10 April 2015. ^ "FIFA World Cup Awards: All-Star Team". Archived from the original on 30 June 2016. Retrieved 22 March 2015. ^ "Premio Nazionale Carriera Esemplare "Gaetano Scirea": Alba d'Oro". Retrieved 21 January 2015. ^ "World Soccer 100 Players of the Century". topendsports.com. Retrieved 10 April 2015. ^ "Golden Foot Legend Franco Baresi". Golden Foot. Archived from the original on 26 September 2015. Retrieved 5 October 2015. ^ "Totti named Player of Year, Baresi the Player of Century". Hurriyet Daily News. 10 May 2000. Retrieved 5 October 2015. ^ Christopher Davies (5 March 2004). "Pele open to ridicule over top hundred". The Telegraph. Retrieved 10 April 2015. ^ "Zinedine Zidane voted top player by fans" (PDF). uefa.com. UEFA. Retrieved 24 July 2014. ^ "Golden Foot Legends". goldenfoot.com. Golden Foot. Archived from the original on 16 April 2015. Retrieved 27 March 2015. ^ "Baresi and Batistuta in Hall of Fame". Football Italia. 31 October 2013. Retrieved 10 April 2015. ^ "Ufficiale Ordine al Merito della Repubblica Italiana Sig. Franchino Baresi" (in Italian). Quirinale.it. Retrieved 12 December 2015. Wikimedia Commons has media related to Franco Baresi.